Expert Repairs. A Class For Everyone. Free First-Year Service. Sewing Tables. Sewing Machines. Our in-house service department is an important factor in choosing to purchase your machine at The Quilting Bee. One concern when purchasing a sewing machine is what to do for service or a needed repair. If you buy a machine online or from a dealer without certified techs in-house you may have to deal with the hassle of shipping it to the manufacturer and then waiting weeks for its return. Or, you could risk voiding your warranty if you take the machine to a technician that is not factory authorized. What is the Standard Repair Time? Standard repair time is 3-5 days. For customers coming from out of town we offer same-day service. Same-day service must be arranged with the Tech Department in advance, please call 509-928-6037. Where is the service performed? 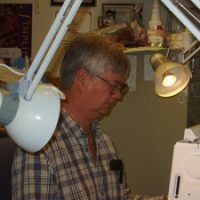 All service is performed in-house by factory authorized certified technicians to provide the most effective and efficient repair of your serger, sewing, quilting or embroidery machine. What makes and models of sewing machines do you service? We can gladly take in any machine for a COA (clean, oil, adjust) and for many machines we can get repair parts if anything needs replacement. Occasionally, we are not able to perform repair work on older or off-brand machines due to an inability to attain parts. If you suspect your machine needs more than just a ‘day at the spa’, please call first and speak with either of our techs, David, Semra, or Greg, to determine if we can meet your needs! Don’t struggle with dull scissors. Bring them along and we will sharpen them for you! $8.50 per pair. Any questions about repairs? Give us a call! David heads the repair tech staff that keeps your machines humming! Ask for David, Stephen or Semra in our Tech Department. Copyright © 2018 The Quilting Bee. All rights reserved.